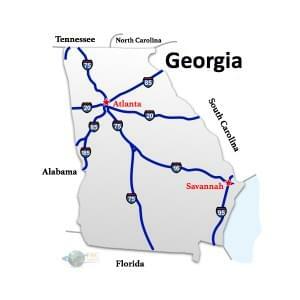 Georgia to Florida Freight shipping and trucking services are in high demand; Atlanta to Miami is a very heavily traveled route.. The Atlanta, GA to Miami, FL route is a 662 mile haul that takes more than 9 hours of driving to complete. Georgia and Florida border one another, and it takes a minimum of 5 hours and 334 miles to get from Savannah, GA to Tampa, FL. The shortest route from Georgia to Florida is along I-75 N; however, there’s also a more easterly route that uses I-95 N, going to Savannah, GA rather than to Atlanta, GA.
Georgia, the Peach State, is on the Atlantic Ocean in the southeastern corner of the country. Its major metropolitan area, Atlanta, is the economic center of the southeast. The Blue Ridge Mountains, a mountain range in the Appalachian Mountain system, make up the northern part of the state, and the southern part of the state is a coastal plain. Along with the Atlantic Ocean, Georgia’s borders include Florida to the south, South Carolina to the east, Alabama to the west, and Tennessee and North Carolina to the north. Georgia is generally hot and humid in the summer and mild in the winter. It can be in the path of tropical storms or hurricanes during hurricane season (June 1 to November 30), and is occasionally affected by snow or ice in the winter. Georgia freight and shipping is concentrated in Atlanta and to a lesser degree, Savannah. The Miami to Atlanta freight shipping lane is a 661 mile haul that takes more than 9 hours of driving to complete. Shipping from Florida to Atlanta ranges from a minimum of 320 miles and 5 hours from Pensacola, Fl to Atlanta, GA to over 600 miles and a minimum of 9 hours on the road from Miami to Augusta. The shortest route from Florida to Georgia is along the I-75N corridor; however, there’s also a more easterly route that uses the I-95 N, passing through Savannah, Ga rather than Valdosta, GA.
Georgia to Florida Freight shipping quotes and trucking rates vary at times due to the individual states industry needs. Since Georgia and Florida are both agricultural, with food processing and food distribution centers, we see plenty of shipments by refrigerated trailer, flatbed as well as by the more common dry van trucks. Our Less Than Truckload (LTL) carriers in both Georgia and Florida are also running a number of regular services between the two states, and it’s an active route for heavy haul freight shipments, as well.